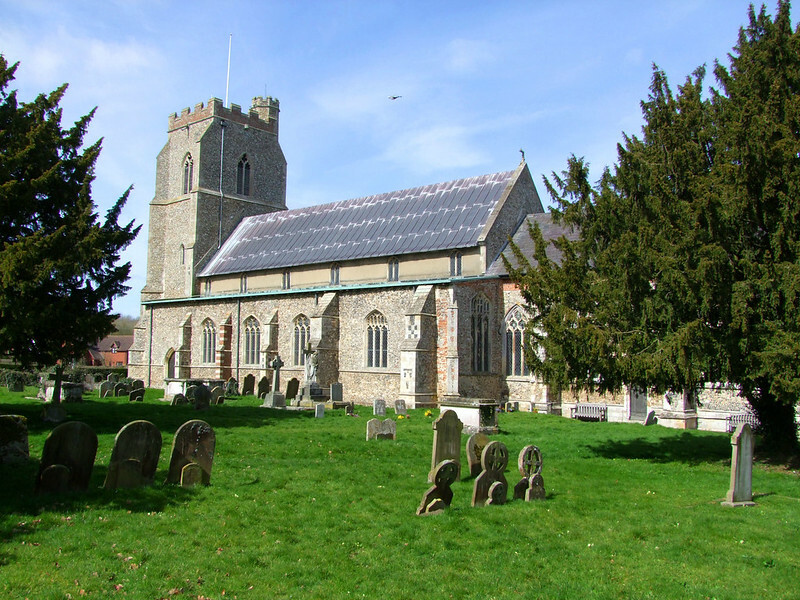 St Mary is a more familiar sight than many rural Suffolk churches, because the main A1120 which heads towards Framlingham from Stowmarket changes its mind at the last moment, and threads through Dennington instead. The church dominates the parish, and you can't miss it. 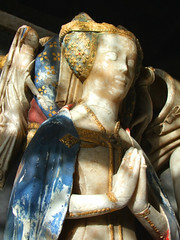 You approach from the west, and may notice that, as at Parham on the other side of Framlingham, there is a rood group of niches set into that side of the tower. The exterior is solid, grand and bulky, impressive but revealing nothing of the treasures to be found within. 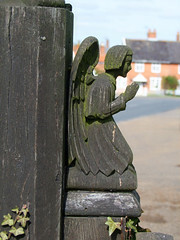 The churchyard gates with their crowns and angels are clearly the work of Munro Cautley. 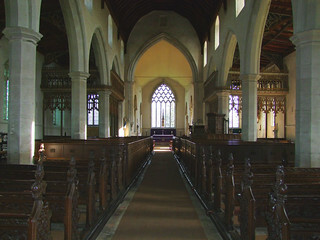 The main entrance into the church is through the north porch, but it is worth having a look at the south side first, with its grand window into the Bardolph chantry at the east end of the south aisle. This walk also confirms how little Victorianisation took place here. The same is true inside, and suggests that the building was in a reasonable condition at the start of the 19th century, and didn't need much restoring. You step into a light, open interior. 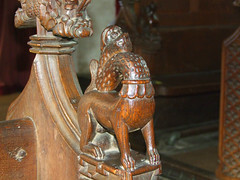 The benches in the nave are divided into two ranges; those to the east are box pews, but to the west and in the aisles are medieval benches with interesting bench ends. 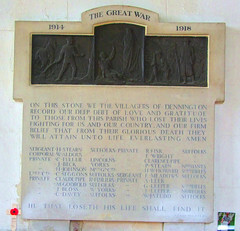 Because of more significant treasures that we will come to in a moment, Dennington is not famous for its bench ends. 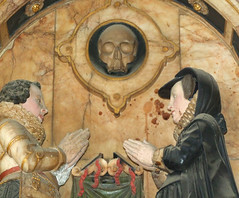 They are not normally spoken of in the same breath as those at neighbouring Wilby, perhaps because they feature animals and mythical beasts rather than Saints and sacraments, but they are easily as good as those at Woolpit, Tostock and Combs, and moreover there are plenty of them. 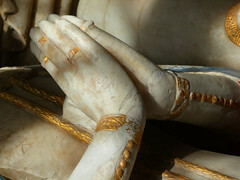 The most famous of all is not a figure on the end, but is a relief carved directly onto the side of the bench. It is a sciapod, a desert creature from the medieval bestiary with enormous feet with which it shaded itself from the sun. 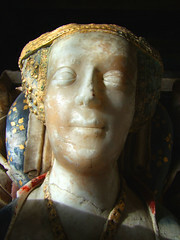 It is the only medieval carved representation in England. Charmingly, three heads of desert rodents poke from their burrows to look at him, as they do in manuscript images of the time. 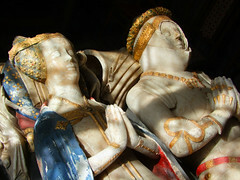 Among the others are England's only medieval tortoise and a giraffe that the carver knew had a long neck, but not that it would hold its head erect. 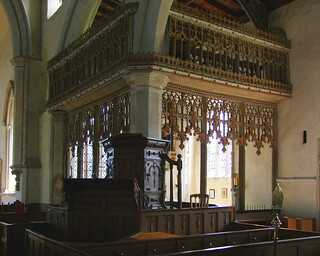 The pulpit sits at the east end of the range, a Laudian creation of the 1620s in a pre-Reformation style. 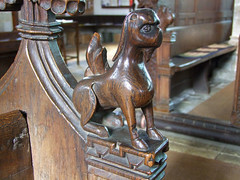 It was later converted into a three-decker affair, the box pew in front of it retaining its range of hat pegs. But I am teasing you. 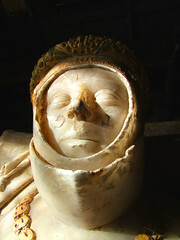 If you haven't come for the sciapod (and the first time I came here it was for that alone) then you have come to see some rare medieval survivals, or one of England's finest 15th century alabaster memorials. 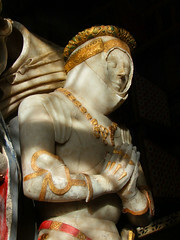 Behind the pulpit, and matching it in the north aisle, are Suffolk's best parclose screens, gilded and brilliant, and uniquely in East Anglia retaining their lofts. 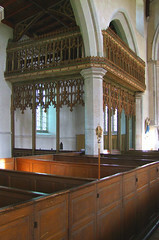 The rood screen has been reduced to a mere dado, but you can see straight away that the lost rood loft (and East Anglia retains none at all of those) would have connected the two parcloses. You could walk from either of the doorways in the north or south aisles up into the parclose loft, across the rood loft and into the other parclose, descending into the opposite aisle. 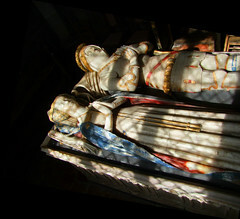 The north chapel is now reserved for quiet prayer, but the south chapel remains Suffolk's most memorable example of a chantry chapel. It contains the Bardolph tombs, which are beautiful. The entire chamber has been designed to pay them homage. The dado of the wooden parclose is crowned with spikes, and the lloft above towers majestically. The great window spills southern light onto them, and, an extraordinary survival, the stone candleholders still flank it. The Bardolphs were an important family. 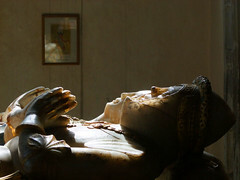 William was chamberlain to Henry VI, a hero of Agincourt and Harfleur, a knight of the garter. 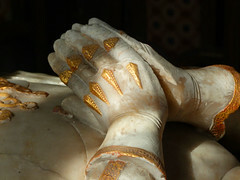 He died in 1441, and lies with his collar of Ss. 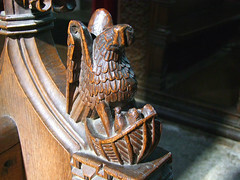 At his feet is a heraldic eagle, and in his helmet he looks a bit like Yuri Gagarin. 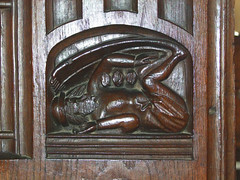 His wife has a gorgeous wyvern at her feet. Her pillow is supported by angels that look as if they are whispering to her and singing her to her rest - a strain of Purcell comes to mind - and she too wears the collar of Ss. 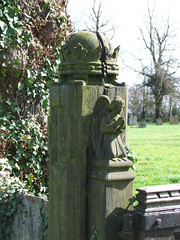 Above the Bardolph tombs is a fine 17th century monument to the Rous family, who succeeded them. 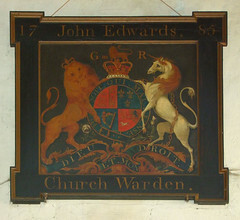 Elsewhere in the nave are a Father Willis organ, a decent 15th century font with 16th century cover, and above it an early George III royal arms with the churchwarden's inscription. In the north aisle, now a village museum, you'll find the sand tray used to teach village children to read and write in the early 19th century. Above, the remarkable botanical windows are by Constantine Woolnaugh. Can they really be as early as 1858? Lots of interest then, and if the chancel did not exist, this would still be a wonderful building. 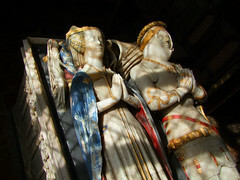 But what the chancel contains would also be worth a visit alone. You step through between brilliantly castellated arch springs. This part of the building is full of the confident beauty of the years before the Black Death turned us all serious and gave us an acute sense of our own mortality. 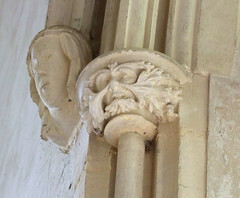 In particular, the jolly window stops, which include a pope wearing a triple tiara, some long-eared owls and a green man. 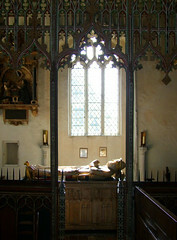 Hanging above the sanctuary is what is, according to Cautley, one of England's four surviving medieval pyxes. Here, the blessed sacrament was stored in Catholic days, for prayer in its presence, exposition and administration to the sick. It is about a metre and a half high, a spire in the sky. The sacrament was reserved in the base where the curtain falls. 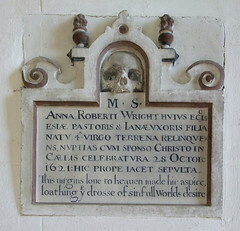 From the mid-16th century Reformation until the restoration of sacramentalism by the Oxford Movement in the 19th century, the sacrament was not reserved at all in English churches. Today, it is falling into disuse in Anglican churches again. Cautley found this pyx in the museum wing back in the 1930s and insisted on it being pressed back into service, so today it is in its original position, reserving the Anglican sacrament. 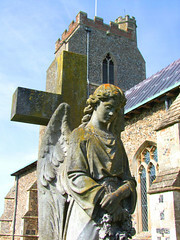 So there we are - one of the best of all East Anglia's churches. 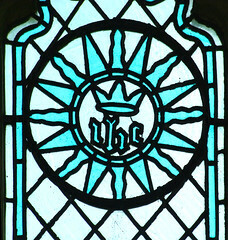 And as if that wasn't enough, a mile or so across the fields from here you will find the non-identical twin church of St John the Baptist, Badingham, by no means as splendid as here, but it does contain one of the best seven sacrament fonts in East Anglia, and Cautley thought that the angel-bedecked roof was England's best example of a single hammer-beam. If Badingham's treasures were miraculously transported to Dennington (and stranger things happened in medieval days, or, indeed, in Victorian restorations) this would be one of the most significant medieval churches in the country. People would flock here, but we are lucky - they don't. 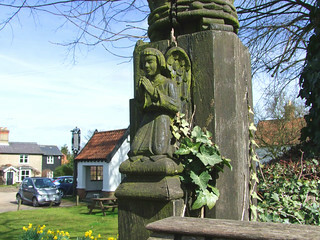 Instead, we can wander leisurely between the two; both are open every day, and both villages have excellent pubs. So - what are we waiting for?